Thing is, Ethereum is designed as a world’s super computer. It can work in isolation as a crowd funding and a dApp building platform where investors can get in via fiat-crypto on ramps as a means of direct investment in promising products. 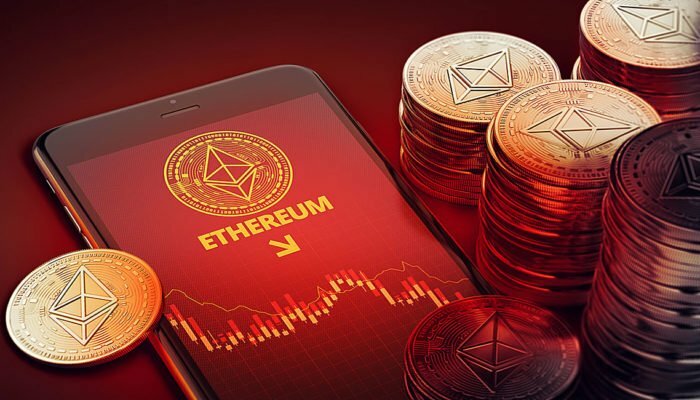 At the same time, companies can build their systems over Ethereum thanks to the underlying security and efforts by the team to solve scalability and further bolster the network security despite slumping ETH prices. But even in the midst of this bullish development as companies race to implement various blockchain based solution with nothing more than the desire to take advantage of the hype around “blockchain” or “distributed Ledger Technology”, Vitalik—in a recent interview with Quartz–is issuing a warning to appropriators saying this misapplication would lead to “wasted time”. He went on to further say that not all companies stand to reap the benefits of blockchain and crypto as it will “still needs much more time to be worked out before it makes sense at scale”. Nonetheless, projects involved in cross-border fund transfer or remittance companies and transactional based companies are the obvious beneficiaries. While at it, Vitalik said he “doesn’t understand deeply” why IBM and other corporations are rolling out blockchains because to him it will lack decentralization that is the hallmark of blockchain. 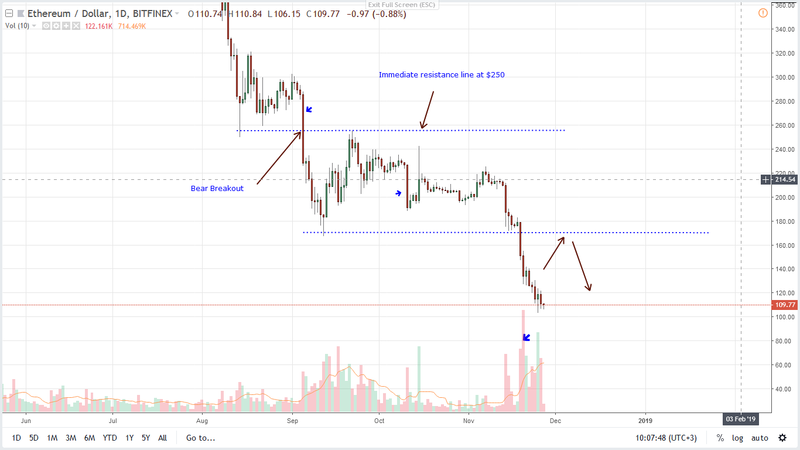 At spot price, ETH/USD is down +85 percent from 2017 peaks and unfortunately for ETH holders, ETH/USD is trading within a bear breakout pattern and at the moment, bottoms aren’t visible. Previously, we had emphasized the need of buyers to keep up the pressure and break above week ending Sep 9 at $250 for bulls to be in charge. However, the drop of BTC prices seem to have triggered a wave of sell pressure than saw bears melt below the main support line at $160 confirming losses of early August completing a classic bear breakout pattern. Unless otherwise there are rejection of lower lows and buyers build enough momentum to reject further loses below $100, ETH might as well drop to $38 and even the undesirable $1 mark as the chart shows. 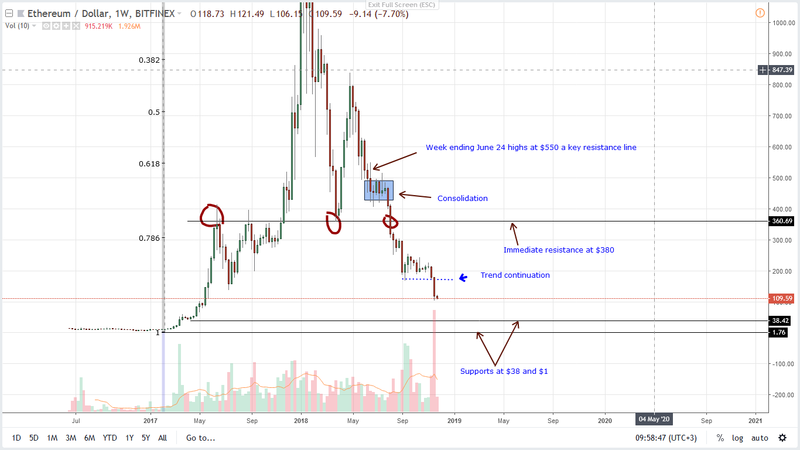 As visible from the chart, ETH/USD is in a downtrend and after dropping to third following their 29 percent drop of last week, it is likely that bears will step on the gas pedal. Notice that as mentioned above, ETH is trading within a bear breakout pattern and it will be ideal if prices recover towards $160 before resuming trend. That might happen going forward as because bears are in charge, every high would be a selling opportunity. But, if sell pressure is too high and we see prices dip below $100 or Nov 25, then odds are ETH would likely drop to $38 or lower going forward.